N.G. 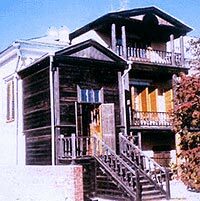 Chernyshevsky's House-Museum in Saratov was founded on September 17, 1920. The founder and the first director of the museum was M.N. Chernyshevsky, the younger son of the writer, who preserved and handed down to the state the most valuable collection of manuscripts, documents, photos, books and personal belongings of his father. From the end of 1920's, the museum has acted as cultural and educational and scientific institute. Today the museum is a complex of buildings. The memorial house of the Chernyshevsky family occupies the central place of the museum. There N.G. Chernyshevsky was born on July 24, 1828 and spent his childhood and youth. After finishing of repair and restoration works, the historic-household exposition will be open in the house. The house of E.I. Golubev, the Chernyshevsky grandfather, is the oldest building of the premises. In this house were born Chernyshevsky mother, sister and his cousin, academician, outstanding scientist, literary critic A.N. Pypin (1833-1904). This building is known under the name " Pypin's House " and it is storage of the museum stock and libraries. The modern building constructed in 1986 houses, there is exposition "The Worthy Son of Fatherland", which represents the Chernyshevsky biography in the context of his epoch. In the wing there is the memorial exposition dedicated to O.S. Chernyshevsky, who lived here until 1883 year, when N.G. Chernyshevsky returned from the Siberian exile. Manuscript-documentary stock of the museum totals 14 thousand units of storage. The main collections of the stock are: Chernyshevsky archive, archive of his family, archive of N.A. Alekseev, the researcher of creative legacy and biography of Chernyshevsky and many others. The stock of graphic materials totals over 7,5 thousand units of storage representing products of painting, drawings and sculptures. The photo stock of museum totals 3,6 thousand photos. The most significant part of collection is N.G. Chernyshevsky's unique photos, his relatives, people whom he has known and the sights of memorable places in Saratov (works of photographers D.Finogeev and Egerev etc. ), in Saint Petersburg, Astrakhan and Viluysk. The stock of household goods totals 1600 units of storage. Unique part of the stock is personal belongings of N.G. Chernyshevsky, his wife Olga Sokratovna, his parents, the Pypin family and M.N. Chernyshevsky. They are subjects of furniture, utensils and small household things. Business Hours: 10 AM - 5 PM. Day off: Monday.